A nationally owned and operated coffee exporting company based in the Jiwaka Province has successfully made its first shipment to South Korea. For Kosem Limited this is its first overseas consignment. Kosem Ltd is one of the lead partners selected for the Highlands region which has taken the initiative to ship out green beans on behalf of local small holder coffee farmers. A total of 320 green beans bags weighing 60kg each were shipped out last weekend. This is the first time for local farmers in Jiwaka to ship their green beans direct to an overseas market and all credit goes to Kosem for sacrificing and taking the initiative. The local farmers gave their parchments to Kosem which in turn processes them into green beans packed and shipped. 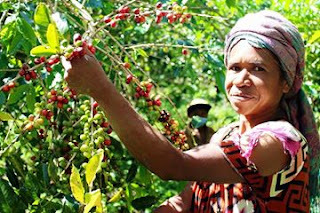 Kosem Ltd is working closely in partnership with Productive Partnership in Agriculture Project funded by the World Bank and the Government of PNG to improve the livelihoods of small coffee farmers in villages to increase direct income. It helps increase production and produce better quality coffee for the farmers. At the launch of the first shipment held at Banz last weekend Kosem managing director John Munnul said Jiwaka was a coffee province and urged the people to grow more because of its economic potential. Mr Munnul said coffee was unique because it earned money for people at the village level.